Makes one 8" Loaf cake / 10 Slices. Sieve the flour, baking powder and baking soda in a bowl and Keep aside. Mix 1 tbsp of flour with 1/3 cup tutty frutti and keep aside. Combine condensed milk, butter, orange juice, orange zest and vanilla in another bowl and beat well. Keep aside. Add the flour mixture to the condensed milk mixture and mix gently using a wooden spoon or spatula. After that add milk and mix well to make a batter of dropping consistency. Lastly stir with tutty frutti and Pour the mixture into a greased and dusted 8" loaf tin. 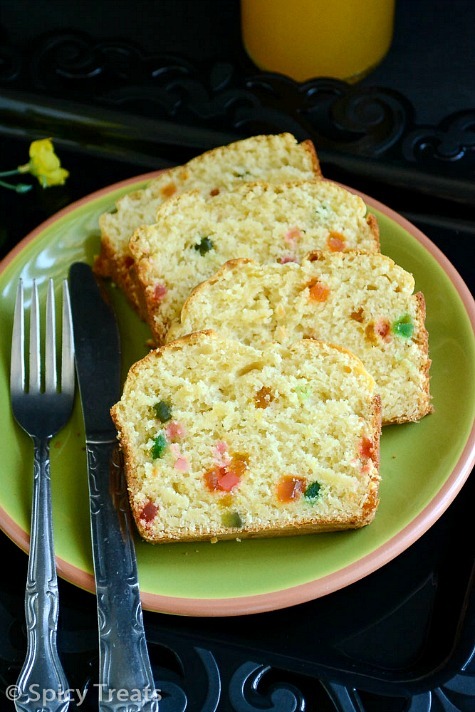 Sprinkle 1 tbsp of tutti-frutti evenly over it and bake in a pre-heated oven at 360 F for 40 to 45 minutes. Remove form the oven, cool on a wire rack and cut into 10 equal slices. Instead of Orange Zest you can also add 3 tbsp Orange Marmalade/Jam. You can also replace tutty frutti with any desired dry fruits/nuts combo. I used 1/2 cup of condensed milk and that sweet was perfect to us. Its mild sweet only but with tutty frutti it was perfect. After cooling slice and keep it in air tight box or zip loc and refrigerate the remaining slices. This is off to Lets Brunch on Sundays event started by Veena andPriya. Lovely cake & loved your clicks. I have also made some fruit cake but with brandy. Your cake looks very light & fluffy. Omg!! this looks simply superb. would love to have one bite. hi sangee hz r u? 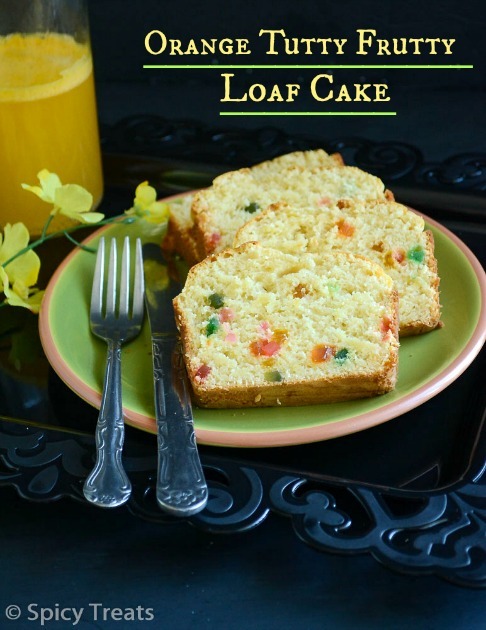 loaf looks delicious and moist...lovely color..
Omg, very attractive and delicious loaf cake, i can have few sliced rite now with a cup of tea. Perfectly made cake.. looks tempting!! Wow looks super soft and delicious.. 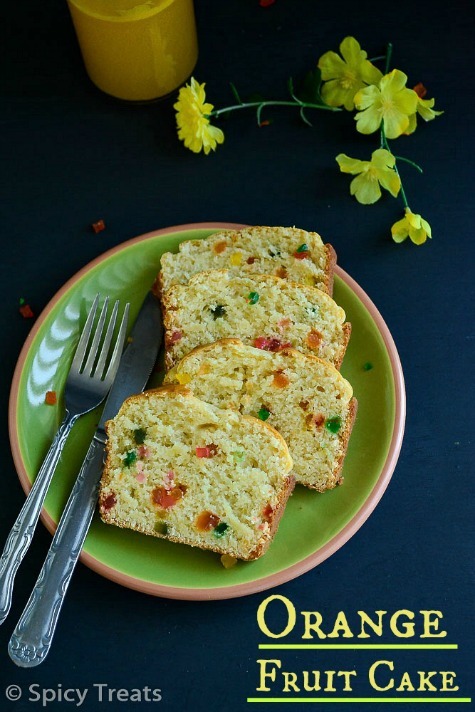 Send me a parcel soon akka.. Lovely clicks :) One of my fav cake..
eggless is good for me, will try soon. i bookmarked this recipe long back from TD's site.. still didnt try it :) yours looks perfect sangee.. Superb, very colorful cake, as you said kids would simply love this..
Looks perfect and delicious! !really tempting!! the cake looks really tasty.can anyone tell me what can be replaced in the place of orange juice?or can it be done without orange juice? hey can i do it without orange juice?or what ca be replaced in its place? 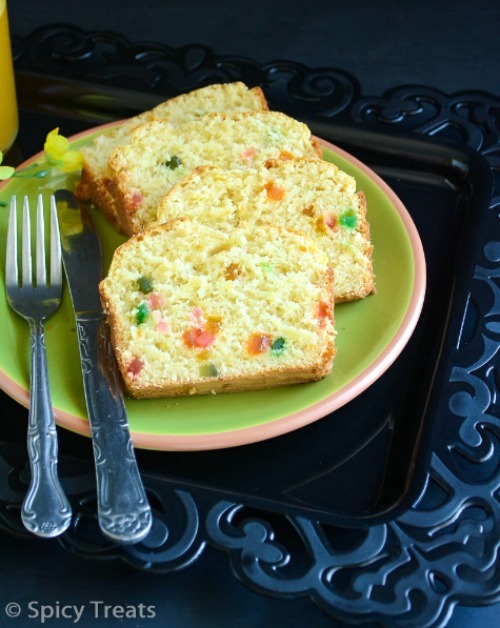 yes.,you can very well skip orange juice and add milk to that quantity and make it as a plain vanilla tutty frutty cake...but i haven't tried this recipe without orange juice, hope it will come out good. If you try do leave your feedback here. Thanks! wanted to try this cake for new yr....can i replace maida with wheat flour? if so any adjustment should be done in baking powder?.. what frosting will be good on this cake? Yes.,you can try with wheat flour, you may need extra 1-2 tbsp of any liquid ingredient and may be a tiny pinch of baking powder. Hope it will come out good but i haven;t tried it. If you try please do share your feedback. Orange frosting or plain vanilla frosting or chocolate glaze will be perfect for this cake. Happy New year Sangeetha and thumbs up. Cake came out perfect. i added half cup + 1 tbsp of orange juice, half cup of condensed milk, and an extra pinch of baking powder for the whole wheat version. vanilla frosting was good on the cake.my little gal enjoyed every bit. Thanks for ur help. Happy New Year Wishes to You too ! Thank you so much for your feedback, happy that it turned out pretty good with whole wheat flour. I am gonna try it soon. Sorry for the delayed response...I guess you can use sugar...try with 1/2 cup sugar and extra 1/4 cup(recipe has 1/4 cup already) or add by tablespoon and adjust accordingly. But I haven't tried with sugar...just a suggestion and hope it will work. Please let me know how it turned out to you.